Automated Softening Point Tester asp-6 - Glorious Green PCB Co.,Ltd. 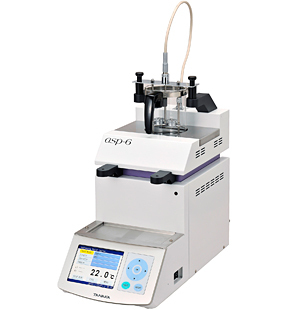 Model asp-6 automates softening point test of bitumen and other materials by utilizing photo-electric device with a wide light beam, which assures reliable detection. Stirring function has been newly applied and a test can be done with one of the four test modes; Water, Glycerin, Water+Stirring, Glycerin+Stirring. 200 test results can be stored in the data memory. Generation of harmful vapor from overheated glycerin is prevented by the safety shutdown. ASTM D36, ASTM E28, EN 1427, IP58, etc.